We are open to the public every Wednesday to Sunday from 11am until 5pm. Private bookings for Hawk Walks and Owl Experiences available seven days a week. their picture to learn more about them. the chance to handle some of our hand-reared birds. Children under five go free. Please email us at nationalbirdofpreycentre@gmail.com for more information. and enjoy the birds in a capacity to suit your needs. Your school visit will include an educational guided tour and talk about our birds. The children will get to experience a handling session with some of our hand-reared birds. We will then finish with an interactive flying display with our Birds of Prey. We're located on the grounds of Russborough House in Blessington, County Wicklow. From Dublin; take M50 to Tallaght and follow the N81 which will bring you right to us. 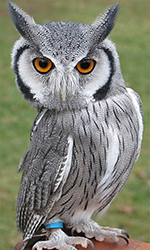 The African Eagle-Owl is one of the smallest of the Eagle-Owls and is widespread across Africa. Its prey consists of small mammals, birds, insects, frogs, and reptiles and often swallows quite large prey whole. The species is a non-specialised feeder and is accordingly itinerant, remaining in a given region to hunt for a few weeks or months then moving on when the local prey is no longer plentiful or easy to catch. Barn Owls were once a common sight in Ireland but due to the widespread use of rat poison and the lack of nesting sites the numbers of breeding Barn Owls in Ireland has plummeted. Although worldwide the Barn Owl is listed as a species of “Least Concern”, here in Ireland it is under serious threat of disappearing. The Boobook Owl, also known as the Mopoke, comes from Australia, New Zealand and New Guinea. Their main hunting technique is perch and pounce, but they are agile with a swift hawk-like action and the ability to manoeuvre rapidly when pursuing any suitably sized prey, particularly small birds, mammals, and large insects such as moths and grasshoppers. The Burrowing Owl is a small, long-legged Owl found throughout open landscapes of North and South America. Burrowing Owls can be found in grasslands and deserts, or any other open dry area with low vegetation. They nest and roost in burrows, such as those excavated by prairie dogs. Unlike most Owls, Burrowing Owls are often active during the day, although they tend to avoid the midday heat. But like many other kinds of Owls, Burrowing owls do most of their hunting from dusk until dawn, when they can use their night vision and hearing to their advantage. Living in open grasslands as opposed to the forest, the Burrowing Owl has developed longer legs, which enables it to sprint as well as fly when hunting. 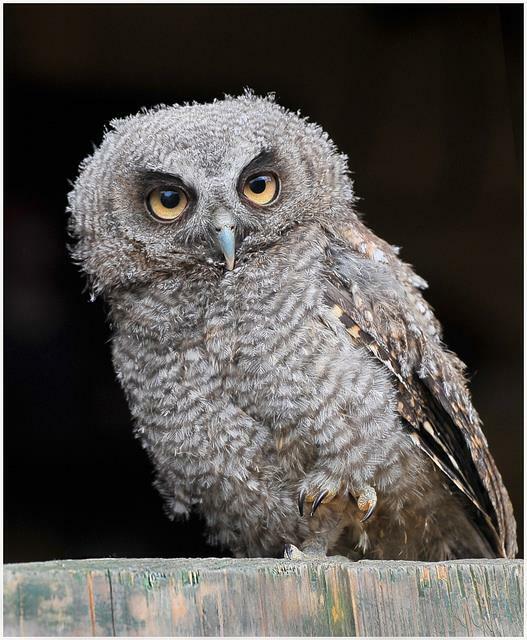 The European is considered to be the largest of all the owl species with a wingspan of over four feet. Eagle owls feed on a variety of prey from mice right up to rabbits, hares and even small deer. It is native right across Europe and into Asia. In fact one of the Irish names for “Owl” translates to “Hooter in the Hollow” and as none of our present native owls hoot it is very probable that they lived in Ireland when this country was covered in woodland. The Golden Eagle is a mountainous bird of the Northern Hemisphere. 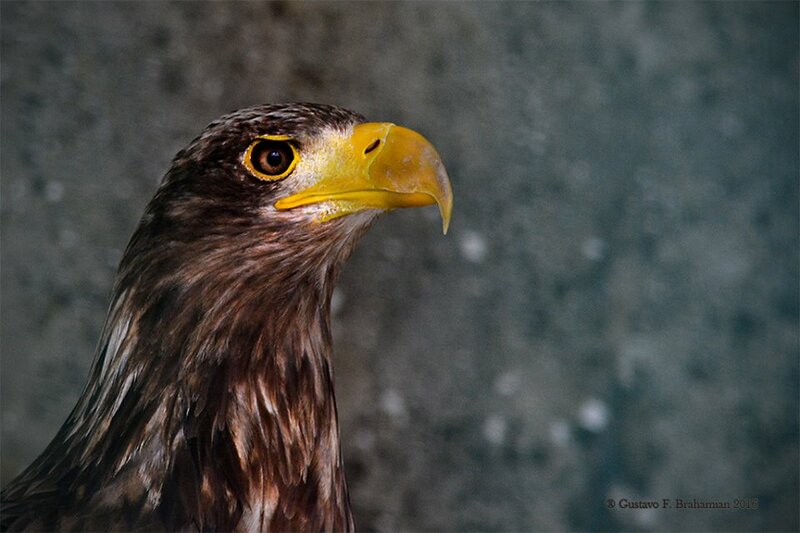 Usually living off a variety of mammals and birds Golden Eagles do take on large mammals such as goats and deer. There is a long tradition of using trained Golden Eagles to catch foxes and wolves. In Ireland these birds became extinct in 1912 through persecution by man, but in 2001 the Golden Eagle Trust re-introduced them to Glenveagh National Park in Donegal. Formerly known as the Bay-winged Hawk or Dusky Hawk, it is a medium-large hawk which breeds from the South-western United States to Chile and central Argentina. While most raptors are solitary, only coming together for breeding and migration, Harris Hawks will hunt in cooperative groups of up to eight individuals. This is believed to be an adaptation to the desert climate in which they live. The diet of the Harris' Hawk consists of small creatures including birds, lizards, mammals, and large insects. 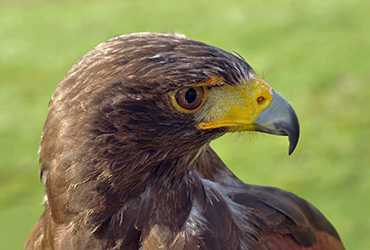 Because it often hunts in groups, the Harris Hawk can also take down larger prey such as jackrabbits and even small deer. 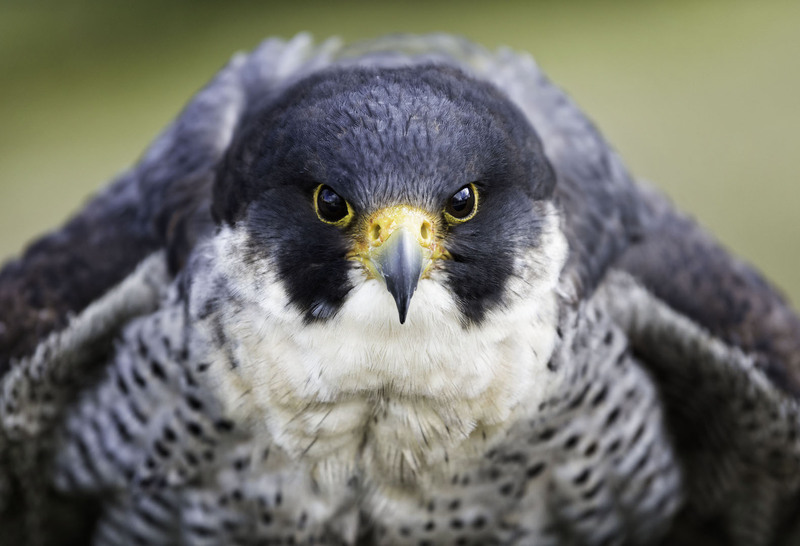 The Peregrine Falcon is the fastest moving creature on the planet. As a bird catching specialist they usually rise high into the clouds before spying a bird below, then folding back their wings and performing the legendary stoop; diving at over two hundred miles an hour and killing birds in the air. Like most birds of prey, the females are larger and more powerful, killing birds up to the size of geese, whereas the smaller males usually take starlings, pigeons and wading birds.. The Eurasian Hobby is probably Europe’s fastest flying bird as it can catch swallows, martins and even swifts in an aerial chase. Insects such as locusts, dragon-flies and moths also make up a large percentage of its diet. A small number of Hobbies reach Ireland each summer as they migrate up across Europe from Africa, making it a rare Summer visitor to our shores. 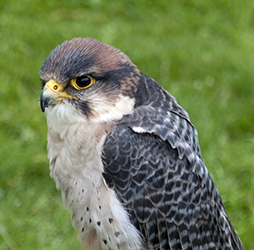 Hybrid falcons are produced for different reasons, usually for use in a variety of ways in the hunting field. 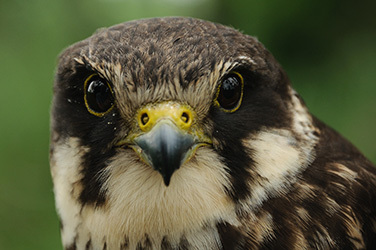 Many Hybrids produced today are bred by artificial insemination, but the very first hybrid falcons ever bred were produced in Ireland in 1971 by accident. 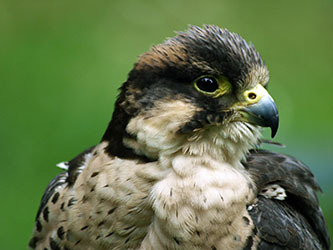 A Peregrine and a Saker Falcon were housed together during the non-hunting season and they produced three off-spring. One of these can be seen today in the Natural History Museum in Dublin. The old name for Kestrel was “wind-hover” and this describes well the main hunting technique used by Kestrels. They usually hover at a height of around 10–20 metres (33–66 ft) over open country and swoop down on prey, usually small mammals, beetles and lizards, but will also chase and catch small birds. 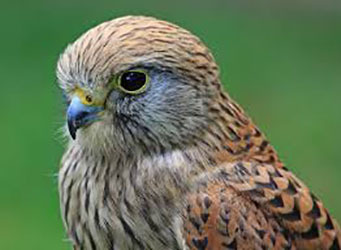 Kestrels can see into the ultra-violet spectrum which enables them to track rodent urine as they hover over-head. The Lanner Falcon is slightly smaller than our Peregrine and is native mainly in the continent of Africa, parts of Asia and has also bred as far north as Italy. Not as specialised a bird hunter as the Peregrine, Lanners also catch a variety of ground game such as reptiles and mammals. A favourite hunting strategy is to wait by desert water-holes and ambush approaching wildlife. 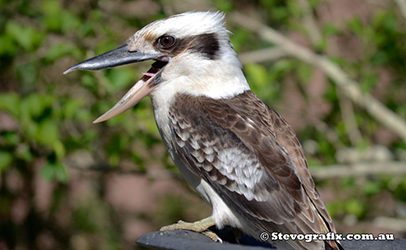 The laughing Kookaburra is a carnivorous bird in the Kingfisher family. Also known as the laughing jackass, it is native to Eastern Australia, it has also been introduced to parts of New Zealand, Tasmania and Western Australia. Male and female adults are similar in plumage, which is predominantly brown and white. A common and familiar bird, this species of Kookaburra is well known for its laughing call. It is the largest in the Kingfisher family and instead of relying entirely on fish Kookaburras can live in dry countryside, catching lizards, snakes, mice and rats. They live in family groups and when one bird starts the laughing call, they all join in! 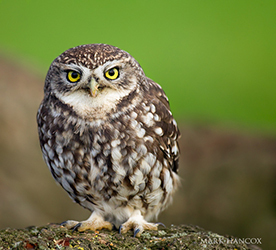 The Little Owl inhabits the warmer parts of Europe and Asia. It was introduced into Britain over a hundred years ago, but does not appear in Ireland in the wild. Little Owls often feed by day, catching insects, earthworms, beetles etc. and will even take mice and small birds. They are very territorial and nest in small cavities with the male bringing food to the female and later for the fast growing brood of up to five young. The Little Owl is often associated with the Greek goddess Athene and the call of the Little Owl was thought to have heralded the murder of Julius Ceasar. The Merlin is a small falcon usually found in moorland, bog land and mountainous countryside of Ireland and across the Northern Hemisphere. The male has blue plumage while the female and both immature sexes are brown in colour. 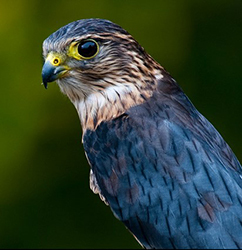 The Merlin is an extremely fast and agile little falcon and specialises in catching small birds like pipits, skylarks and finches. In traditional falconry the Merlin was used to catch skylarks, both birds rising to the heavens to out-fly the other, while the skylark would sing as a show of strength to his pursuer! 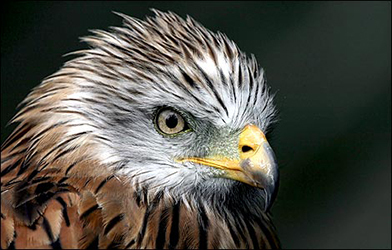 The Red Kite had been extinct in Ireland for two hundred years, but in 2007 a reintroduction programme was started in County Wicklow. The Kite's diet consists mainly of small mammals such as mice, voles, shrews, young hares and rabbits. It also feeds on a wide variety of carrion including sheep carcasses and dead game birds. Live birds are also taken and occasionally reptiles and amphibians. Earthworms form an important part of the diet, especially in the Spring. As scavengers, Red Kites are particularly sensitive to poisoning. Illegal poison baits set for foxes or crows are indiscriminate and have killed protected birds such as Kites. The Sea Eagle or Erne is one of the largest eagles in the world, living mainly on fish but also catching mammals and birds such as waterfowl. When times are tough these birds will scavenge to survive. In Ireland these birds became extinct in 1901 through persecution by man, but in 2007 the Golden Eagle Trust re-introduced them to Killarney National Park in County Kerry. 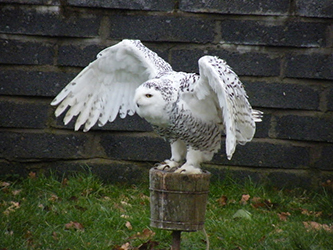 The Snowy Owl is typically found in the northern circumpolar region, where it makes its summer home. However, it is a particularly nomadic bird, and because population fluctuations in its prey species can force it to relocate, it has been known to breed at more southerly latitudes. In the early nineties it even tried to breed in Donegal, Ireland. This powerful bird relies primarily on lemmings and other small rodents for food during the breeding season. They are opportunistic hunters and prey species may vary considerably, especially in winter. They feed on a wide variety of small mammals such as voles and deer-mice, but will take larger mammal prey including hares, marmots and squirrels. This raptor is almost strictly nocturnal, initiating its activities at dusk. During daytime this owl roosts in dense foliage trees, probably close to the trunks like other Screech Owls. This owl prefers semi-open habitats, like timbered savannah, semi-open areas with scattered trees, forest edges, second-growth forests, plantations, and also town parks and avoids pure grasslands or grassland savannahs. Food habits are poorly known. Few samples of pellets and field observations suggest a mostly insectivorous diet, including crickets, katydids, beetles, ants, spiders and scorpions. The Turkey Vulture is a bird of the Americas and has a highly developed sense of smell, unlike its African and Asian counterparts. It is sometimes called the Turkey Buzzard, a name given to it by the European settlers, calling it after our own native Common Buzzard which has a similar soaring flight. 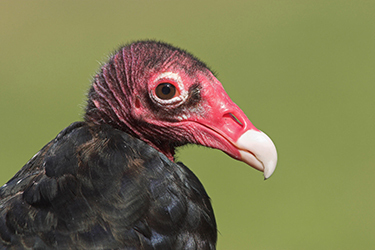 Unlike most other vultures, which evolved from the Hawk family, Turkey Vultures and the even larger Condors evolved from a common stork ancestry. 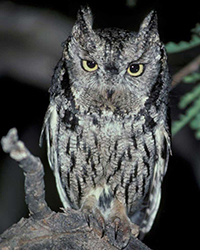 The Screech owls are a family of owls from the Americas, and can be found from Canada right down into Central America. Their plumage is perfect camouflage in woodland and they often nest in holes in trees made by woodpeckers. These birds are opportunistic predators and wait on perches to swoop down on unsuspecting prey like mice, young rats, small birds and they also catch insects in flight. They are active at dawn, night or near dusk, using their excellent hearing and night vision to locate prey. The White-faced Scops comes from the African continent. It is a small owl that feeds on a wide variety of small prey, from spiders and scorpions to rodents, reptiles and the occasional small bird. Like other small owls this bird uses the wait and pounce technique; watching and waiting for movement in one area before moving on to fresh ground. They inhabit a wide diversity of terrains; being found in woodland, thorny bush country and open grasslands if there are trees to hunt from. They hunt mainly at night and the ear tufts help to break up their outline while sitting still.